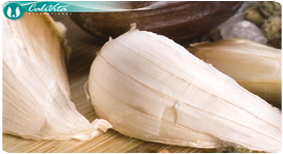 - increases resistance to disease through their immunostimulatory properties. Uno está expuesto al estrés en cada momento de la vida. El cumplimiento de las exigencias de la familia y del lugar de trabajo, los conflictos, los problemas financieros, la contaminación acústica y ambiental, todos significan estrés que es especialmente dańoso a largo plazo. La rodiolina es una solución natural, que ha sido aplicado contra ellos desde hace siglos. 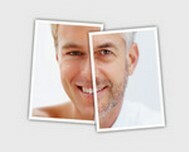 Man is exposed to continuous stress throughout the day. Trying to meet the expectations at home and workplace, conflicts, financial problems, noise and environmental pollution is stressful and all this could be especially harmful for our body in the long run. Rhodiola has been applied for centuries and is a natural solution to all this. Rhodiolin (Rhodiola rosea) is a member of the Crassulaceae family of plants, and grows in cold regions of the northern hemisphere. It is found in the arctic regions of Siberia, and in more temperate climates, it is restricted to mountainous regions. Rhodiolin is rich in several beneficial nutrients including flavanoids, tannins, essential oils, and antioxidants. Most of the health interest in rhodiolin, however, is because of its content of several types of phytochemicals called phenylpropanoids. Phenylpropanoids in rhodiolin such as rhodioniside, rosavin, and rosiridin appear to be responsible for Rhodiolin’s adaptogenic properties. An adaptogen is a substance that helps the body cope with, and resist adverse conditions such as mental or physical stress, and exerts a normalizing influence on the metabolism. Several different monoamine neurotransmitting hormones (eg: serotonin, dopamine) play an important role in regulating mood, sleep, attention, cognition, motor activity and sexuality. These neurotransmitters are broken down by the enzyme monoamine oxidase (MAO). 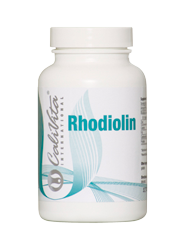 Some studies have suggested that the phenylpropanoids in rhodiolin may play a role in inhibiting the action of MAO, and thus may help to optimize the level of the mood elevating neurotransmitters. 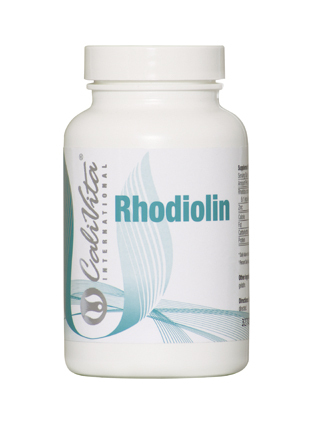 Some studies have also indicated that rhodiolin may support the level of beta endorphins in the body. Beta endorphins are natural analgesics (pain relievers) produced in our body. Supplementation with rhodiolin may provide nutritional support for stress relief, mental alertness and vitality, and a general feeling of well-being. Just relax. Live at least 100 years. Nature has endowed us with several herbs with which we can soothe or refresh our nervous system. Rhodiola rosea L. is one of the most popular adaptogen plants of antistress effects. The herb has a centuries-long history in traditional medicine. Tibetan doctors considered it for its general restorative properties as well as its essence of vitality and it may also be used against mountain sickness. Mongolian doctors used to prescribe it against tuberculosis while in China it was used for its blood purifying and blood circulation stimulating effects. Several written records of Asian people mention this herb, the root of which they used to make tea, and they believed that whoever drank it daily would live to be 100 years old. The herb Rhodiola Rosea used in the Rhodiolin capsule has been the subject of continuous study in several countries around the world. But what do these studies reveal? The capsule Rhodiolin was introduced into the global network of CaliVita® more than a decade ago and its success has been unbroken ever since. Based on feedback some use it to reduce or control everyday tension or in unexpectedly emerging stressful situations. Others use it to maintain their general energy level. If taken before bedtime it may help sleeping through the night by balancing the level of stress accumulated during the day. In addition, it may be a natural supplementary component for curing depression. its effect is maintained by continued long-term use ie. it would result in habituation. It can be excellently complemented with tablets Stress Management or MagneZi B6 as well as BioHarmonex® device. So it makes sense to resort to nature’s help if you feel your nervous system and body needs some mild and balanced support. Adaptogen? It is some relative of adapter, isn’t it? Just like an adapter for electrical appliances for example lamps, computers etc. it measures out an accurate and necessary amount of current they need for faultless operation, adaptogen plants are utilized exactly in the amounts our body requires them. No more and no less. Due to this excellent property these plants, as opposed to medicines, are not likely to cause addiction, they have no known side effects, they collaborate with our body mildly and their effects continue even if used in the long run.